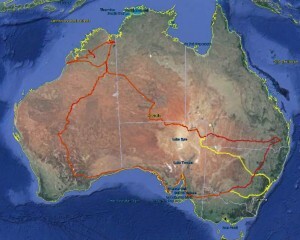 I recently created a map from APRS archives of a recent trip by some friends over about eight weeks through central and north west Australia and back by the southern coast. Above is a graphic of the created map, but the ‘real’ map is not simply an image, but it is a kml file for Google Earth which you can view / zoom / scroll, for example in Google Maps by clicking on the map above. This article explains how to create the kml file from APRS archives. Step1: fetch the archived posits from findu.com. findu.com offers a valuable service that contains an archive of posits for about six months, a great service that is deserving of financial support. To fetch the last 48 hours for YOURCALL, use http://www.findu.com/cgi-bin/posit.cgi?call=YOURCALL&start=48&comma=1&time=1. select the entire page in the browser, Copy and Paste it into a plain ascii editor and save it as a text file. Documentation of the findu posit report parameters is at posit – displays parsed position reports. GPSBabel is a great file converter, free, and again deserving of financial support. Script findu.bat for Windows accepts two optional positional parameters, a file name (without extension, default is finduposit) and colour (in the form AABBGGRR in hex, default is ff0000bf for red). rem copy the screen output and paste it into an ascii editor (for html to text conversion). GPSBabel is available for *nix, and a shell script could be written for similar behaviour. finduposit.bat uses a gpsbabel style file finduposit.sty to describe the format of the input data as follows. APRS has a host of issues that degrade the quality of such mapping, and a solution is to collect a stand alone track log of your trip. A simple inexpensive extension to typical APRS configurations is described at OpenLog for TinyTrak. Comparisons of the stand alone track with APRS are given at OpenLog for TinyTrak – drive test.